This Saturday 21 June will mark one month since Luis Enrique was presented as the new FC Barcelona first team manager. He and the club have been working hard ever since then to put together a squad for next season, and four new arrivals have already been announced, namely Ter Stegen, Deulofeu, Rafinha and Rakitic. The latest of these was revealed on Monday. Croatian international Ivan Rakitic has joined Barça from Sevilla. The midfielder, who is currently in Brazil playing at the World Cup, will sign a contract for five seasons. German keeper Marc-André ter Stegen has already been officially welcomed to the Camp Nou. One day after Luis Enrique was presented, the Auditori 1899 was full once again, this time to introduce the goalkeeper signed from Borussia Mönchengladbach, and who has already signed a contract binding him to Barça until 2019. 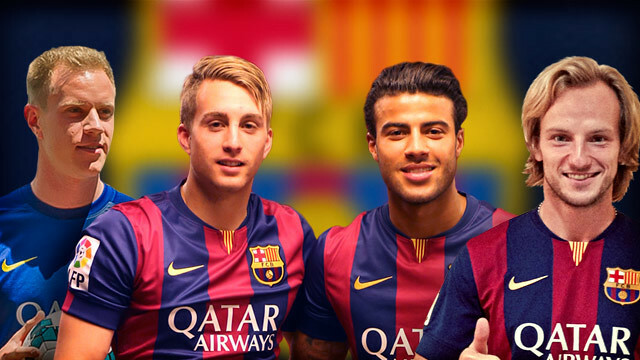 In addition to the signings of Ter Stegen and Rakitic for the 2014/15 season, FC Barcelona has also recuperated the services of Gerard Deulofeu, who spent last season on loan to Everton, and Rafinha, who did likewise at Celta, playing under Luis Enrique. The two players met the other day in the Camp Nou changing room to try on the new first team shirt and tread the Camp Nou turf.